Mix sugars, butter, shortening, vanilla and eggs in large bowl. Stir in flour, cocoa, baking soda and salt. Stir in vanilla milk chips and nuts. Bake 10 to 12 minutes or until set. Cool slightly; remove form cookie sheet. Cool on wire rack. 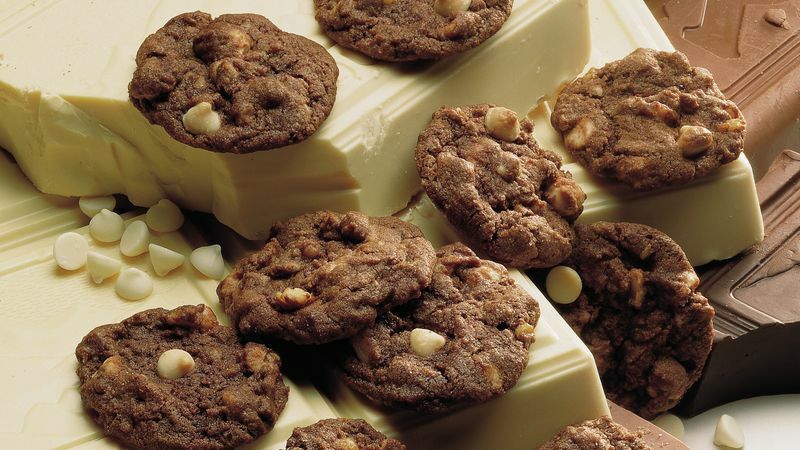 Double the chocolate decadence by substituting 1 1/2 cups semisweet or milk chocolate chips for the white baking chips. Make this type of cookie a little faster with a pouch of Betty Crocker® double chocolate chunk cookie mix made with semisweet chocolate chunks. Just stir in 1/2 cup each white baking chips and chopped nuts before baking.